The Boston Cooking-School. Internet Archive Book Images / flickr / 1908 / Image from page 22 of “The Boston Cooking School magazine of culinary science and domestic economics”. Fannie Merritt Farmer wrote one of America’s definitive cookbooks, and created standardized North American measurements. This is often admittedly over-stated. Fannie didn’t actually standardize in her books what exactly a given measurement was — e.g. 1 cup equalling 8 oz — but rather she specified how to measure: how to level off cups of dry measures, how to level off teaspoons, etc. At no point, though, did she define a teaspoon, in the way that it is now, for instance, as 5 ml. A feisty red-head who never married at a time when women were encourage to do just that and stay home, she not only got out and made a career for herself, and a name in history, but did all this despite a handicap which came to her early in life. The publishers, Little, Brown, didn’t seem to have as much confidence in the book as Fannie did, as they insisted that she pay for the printing. Not daunted, she came up with the money to cover its publication to pay them with. As a minor side-effect, she retained full-copyright, which made her wealthy and Little, Brown, no doubt, very regretful, as the book continued to be published into the 1990s. 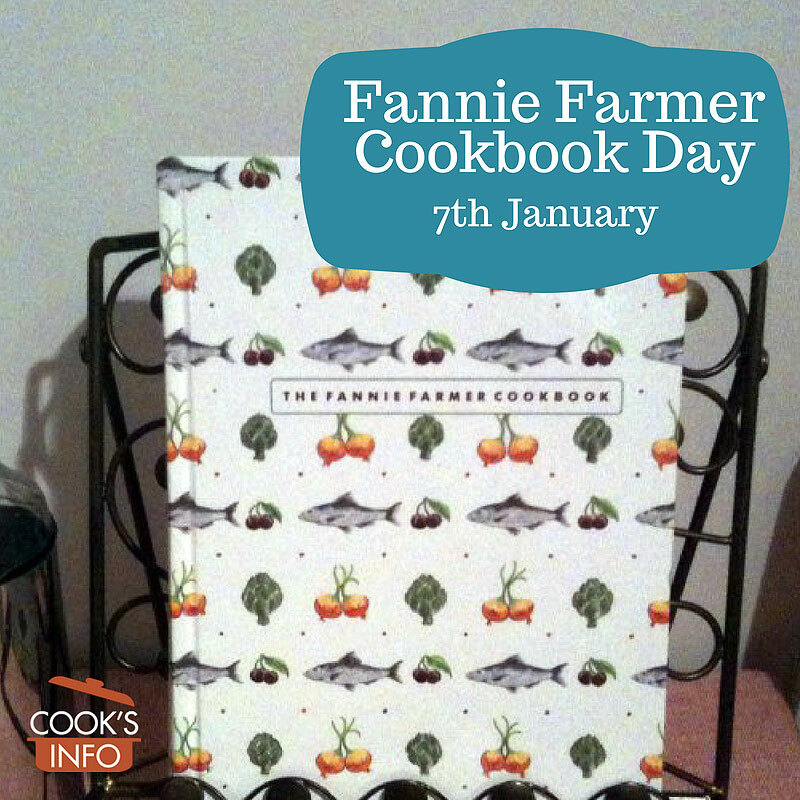 In fact, the book was so much hers than in later years the name just got changed to “The Fannie Farmer Cookbook” to reflect what people were calling it, anyway, so strong was her association with the book. 1870 — At the age of thirteen, Fannie had to drop out of high school owing to a stroke that paralysed her from the waist down. She recovered, but always had a bit of a limp the rest of her life. While she was kept home recovering, she got interested in cooking, and then later got a job as a mother’s helper for a family called the Shaws. She got the determination about how important standardized level measurements would be while teaching the Shaw’s daughter, Marcia, how to cook. Her enjoyment of cooking changed her education plans. 1894 — Fannie became director of the Boston Cooking School. 1896 — Fannie re-published the Boston Cooking School Cookbook. A first edition had been published by Mary J. Lincoln (aka Mrs D.A. Lincoln), the school’s first principal, in 1884. 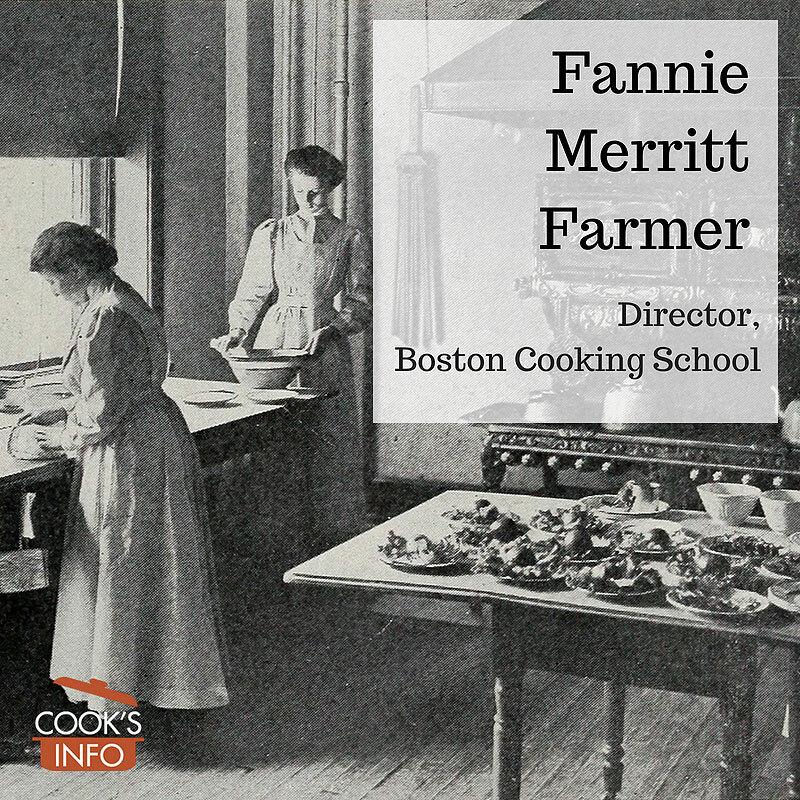 1902 — Fannie left the Boston Cooking School and on 23 August 1902, opened Miss Farmer’s School of Cookery in Boston, Massachusetts. The goal of the school was to train housewives and nurses in cooking. At the Boston School, the goal had been to teach people how to teach cooking. 1905 — With her sister Cora Farmer Perkins, Fannie started writing a regular page for the Woman’s Home Companion magazine for then years from 1905 to 1915. 1915 — Fannie died at the age of 58 on 14 January 1915 in Boston. Though she had had another stroke towards the end of her life which put her in a wheelchair, she kept on teaching and had given a lecture just ten days before she died. 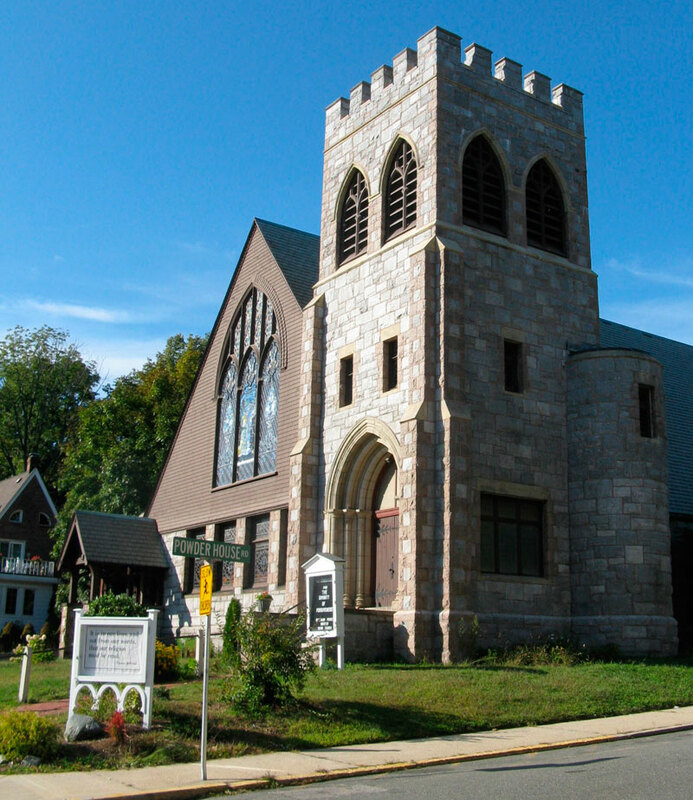 She was buried at Mount Auburn Cemetery in Cambridge, Massachusetts. 1915 — Alice Bradley (1875-1946), a former student, purchases Miss Farmer’s School of Cookery from Cora and becomes its principal. She ran the school until 1944. 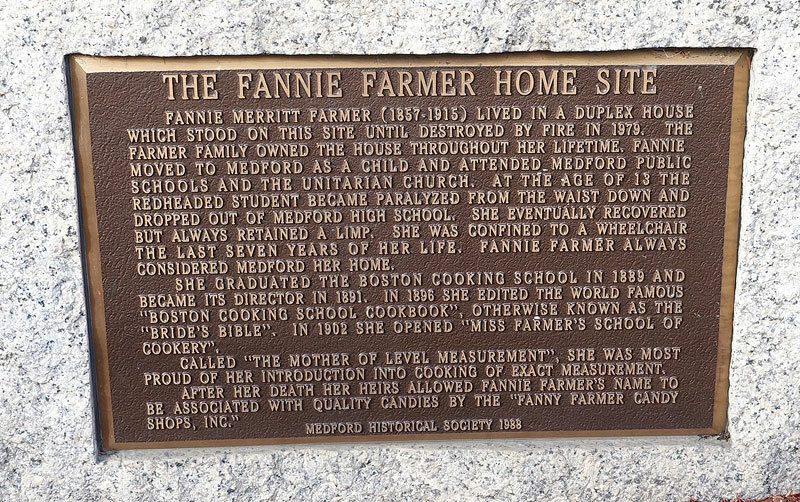 1979 — Fannie’s family had lived in a duplex house in Medford at the corner of Paris and Salem Street. The house burnt down in 1979. A historical marker was erected. The Fannie Farmer school stayed in business until 1944. 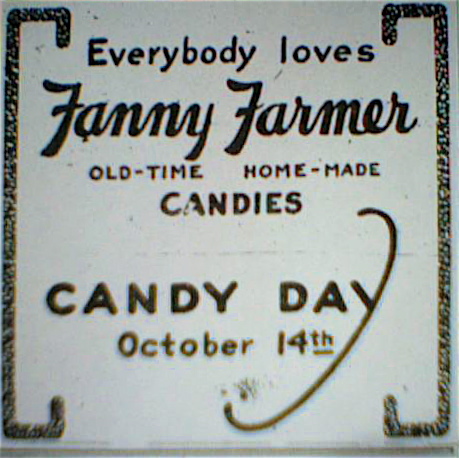 Her heirs licensed her name to the “Fanny Farmer Candy Shops” company, based in Chicago, and actually owned by Archibald Candy Corp. The spelling of the name was deliberately changed from Fannie to Fanny. 1910 — Revised edition, added 125 new recipes. 1936 — 6th edition by Fannie’s sister Cora, with her son Herbert and Herbert’s wife, Wilma Lord Perkins. 1941 — 7th edition. By Wilma Lord Perkins. Published by Little, Brown in Boston; McClelland & Stewart in Toronto. Reprinted 1942, 1943. 1946 — 8th edition. By Wilma Lord Perkins. 1951 — 9th edition. By Wilma Lord Perkins. Here are Fannie’s directions about how to measure. “Correct measurements are absolutely necessary to insure the best results. Good judgment, with experience, has taught some to measure by sight; but the majority need definite guides. Tin measuring-cups, divided in quarters or thirds, holding one half-pint, and tea and table spoons of regulation sizes,–which may be bought at any store where kitchen furnishings are sold,–and a case knife, are essentials for correct measurement. Mixing-spoons, which are little larger than tablespoons, should not be confounded with the latter. Flour, meal, powdered and confectioners’ sugar, and soda should be sifted before measuring. Mustard and baking-powder, from standing in boxes, settle, therefore should be stirred to lighten; salt frequently lumps, and these lumps should be broken. A cupful is measured level. To measure a cupful, put in the ingredient by spoonfuls or from a scoop, round slightly, and level with a case knife, care being taken not to shake the cup. A tablespoonful is measured level. A teaspoonful is measured level. When dry ingredients, liquids, and fats are called for in the same recipe, measure in the order given, thereby using but one cup.” Fannie Merritt Farmer. The Boston Cooking-School Cookbook. Boston, Little, Brown And Company (1896). Pages 27 to 29. Fannie also established that order of ingredients given was important: “Mix ingredients in order given.” Ibid., Brownies Recipe, page 424. “The Boston Cooking School taught Fannie Farmer to cook with the purpose-made measuring cups that had lately become available. And she in turn recognized no other method. Her entire approach was about offering cooks a sense that they could do anything, so long as they obeyed the rules and followed her instructions to the letter: absolute obedience would lead to absolute proficiency. As a latecomer to the kitchen, Farmer had none of the natural instincts to fall back on about how much of any ingredient was needed and how long to cook it. Everything had to be spelled out. She would go so far as to stipulate that the pimento garnish for a certain dish be cut three-fourths of an inch long and half an inch across. The idea was to create recipes that would be absolutely reproducible, even if you knew nothing about cooking: recipes that ‘worked.’ She inspired the same kind of devotion as Delia Smith in Britain today. (‘Say what you like about Delia,’ people often remark, ‘her recipes work.’) Evidently, plenty of people found Farmer’s level measures comforting, given her colossal sales (her 360,000 copies sold put her in the same league as Uncle Tom’s Cabin, which had sold more than 300,000 in the months after publication). 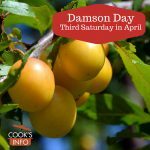 So long as you had your cup measures and your case knife, these were recipes you could trust, and the admirable thing about a Farmer recipe was that you could repeat it time and again with roughly the same results. Whether we would want to achieve Farmer’s results today is another matter. Her tastes have not worn well. She was fond of such things as spaghetti timbales (soggy cooked pasta reheated in a mold with salmon forcemeat) and avocados filled with oranges, with truffle decoration and a condensed milk sauce. This brings to mind the food writer Elizabeth David’s comment: ‘What one requires to know about recipes is not so much do they work as what do they produce if they do work?’ Wilson, Bee. Consider the Fork: A History of How We Cook and Eat. Basic Books. Kindle Edition. 9 October 2012. PP 126-127. Her name is indeed Fannie Merritt Farmer, and not as is sometimes seen, Fanny, or Merrit with just one “t”. 1. ↑ This is often admittedly over-stated. Fannie didn’t actually standardize in her books what exactly a given measurement was — e.g. 1 cup equalling 8 oz — but rather she specified how to measure: how to level off cups of dry measures, how to level off teaspoons, etc. At no point, though, did she define a teaspoon, in the way that it is now, for instance, as 5 ml. 2. ↑ Fannie Merritt Farmer. The Boston Cooking-School Cookbook. Boston, Little, Brown And Company (1896). Pages 27 to 29. 3. ↑ Ibid., Brownies Recipe, page 424. 4. ↑ Wilson, Bee. Consider the Fork: A History of How We Cook and Eat. Basic Books. Kindle Edition. 9 October 2012. PP 126-127.